George Monbiot wrote that Rio+20 is 283 paragraphs of fluff. If this is the best our world leaders can come up with, what is the solution to our global environmental crises? "In 1992, world leaders signed up to ‘sustainability’ however in no time this mutated to ‘sustainable development’ then ‘sustainable growth.’ Now, in the 2012 Rio+20 document it has become ‘sustained growth.’ But if sustainability means anything, it is surely the opposite of sustained growth. Sustained growth on a finite planet is the essence of unsustainability as we will soon run up against the natural limits to growth." Apparently the Obama administration tried unsuccessfully to delete 'unsustainable consumption and production patterns' and disassociate economic growth from the use of natural resources. The only thing to their credit was that the states to sign the draft haven't abandoned their declarations from the last Earth summit 20 years ago. The Philippines were disappointed with the summit. As a result, the draft document, which seems set to become the final document, takes us precisely nowhere: 190 governments have spent 20 years bracing themselves to "acknowledge", "recognise" and express "deep concern" about the world's environmental crises, but not to do anything about them. The declaration is remarkable for its absence of figures, dates and targets. There is no programme, no sense of urgency or call for concrete action beyond the inadequate measures already agreed in the declarations. Its tone and contents would be better suited to a retirement homily than a response to a complex of escalating global crises." And while leaders do nothing at Rio, there is an alarming number of environmental activists being killed defending land and forests. In the last decade more than 700 land and forest defenders have been killed, rising to as many as 106 in 2011 - thats more than 2 per week. 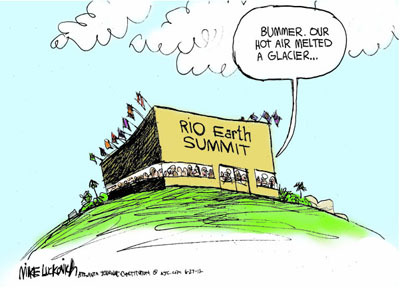 Our leaders have failed to protect our earth and our future and instead immerse themselves in the glamour of lavish events like Rio+20 while effectively doing nothing of importance. 190 governments have given up on multilateralism, given up on the world and given up on us. Monbiot concludes "It suggests that the 190 governments due to approve this draft have, in effect, given up on multilateralism, given up on the world and given up on us." So what do we do now? Here in Tweed Shire, NSW we have a council that talks constantly of the need for economic growth while ignoring sustainability and protection of biodiversity and natural habitat. In N.S.W. we have an Environment Minister who says that logging is good for koalas and a state government that is hell-bent on supporting developers while ignoring rampant extinctions and potential loss of World Heritage values and has just approved a bill to allow amateur shooters in National Parks. Isn’t it time leaders stopped letting activists defend the planet on their own...then again maybe it is up to us? After all, we outnumber them! In Iceland they have recently arrested corrupt governments and Rothchilds bankers responsible for the economic crisis in 2008, fuelled by the Icelandic people’s demands. “Sustainable development” is development that meets the needs of the present without compromising the ability of future generations to meet their own needs. In arguing for sustainable development ecologists offer the usual observations on dwindling resources, wasteful consumption, and expanding populations. What "sustainable" alternatives do they, or can they, propose? Conservation, recycling, renewable energy? Sustainability and development are contradictions. To grow means "to increase naturally in size by the addition of material through assimilation or accretion." To develop means "to expand or realize the potentialities of; ... to a fuller, greater, or better state." When something grows it gets bigger. When something develops it gets different, more complex. "Sustainable growth" or "development" is an oxymoron! In the minds of many people, growth has become synonymous with increase in wealth. However, population growth doesn't increase wealth for the majority, but simply dilutes what wealth we have between more people. Sustainable Growth: An Impossibility Theorem, written by Herman Daly and Kenneth Townsend, is one of the book’s many classics. Politically it is very difficult to admit that growth, with its almost religious connotations of ultimate goodness, must be limited. Even “green growth” is not sustainable. There is a limit to the population of trees the earth can support, just as there is a limit to the populations of humans. No growth in the natural world can be perpetual. In 1992 Rio de Janeiro also hosted the “Earth Summit,” where sustainable development was first identified as a top priority on the agenda of the United Nations and the international community. 20 years later, our environment is getting worse, not better. Over the same 20-year period, this environmental degradation has coincided with a period of sustained progress across a range of measures of human development. Population, consumption, and resource in-efficiency – are driving the degradation of the Earth - the "hand that feeds us"! Science points to the tipping points we are fast approaching. RIO+20 was always just tourism marketing, like the aims and budgets of Australia's National Parks and Wildlife Services, which now are politically mandated to focus on 'visitation' in place of 'conservation'. See the wildlife, even if they are murals. Would you like merchandise with that?